PROGRESO — Even those who don’t follow soccer quickly realize that the Progreso Red Ants look to score at every opportunity. When the opposing team plays with eight defenders, coach Margarito Jimenez Jr.’s strategy is to attack. When the opposing team is looking to counterstrike, his game plan is to attack. And when the Red Ants are facing a team with two players who have combined for more than 100 goals this season, Jimenez’s plan is to attack, at least until Progreso scores a goal. Javier Leonor has registered 66 goals for the top-seeded Palestine Panthers (34-0), while teammate Riley Harper has scored 38 goals. Progreso and Palestine meet at 6:30 p.m. Wednesday in Georgetown in the Class 4A state semifinals. Progreso's Hugo Guajardo looks for an open player against Liberty Hill during the Class 4A Regional Championship game at McAllen Memorial Veterans Stadium Saturday, April 14, 2018, in McAllen. 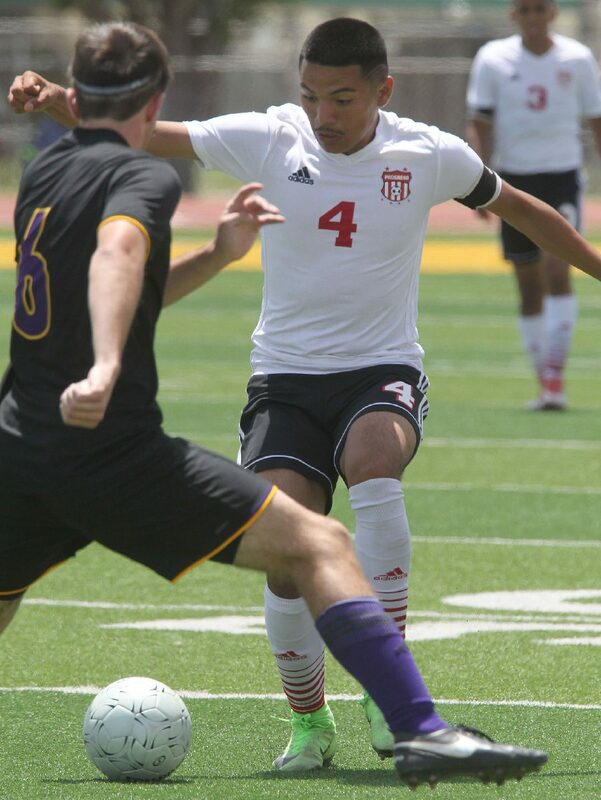 Progreso's Anthony Vasquez against Liberty Hill player during the Class 4A Regional Championship game at McAllen Memorial Veterans Stadium Saturday, April 14, 2018, in McAllen. While the Red Ants are known for a prolific offense — one that scored 16 goals in a game earlier this year and has outscored opponents 14-1 in the playoffs — Jimenez stresses that his defense is a wall. As soon as the Red Ants broke up their informal meeting Monday, the three-time Class 4A Region IV champions started working on defense, specifically defending the long ball — a common counterstrike strategy against a high-octane offense. Valley View is the top seed in the Class 5A state Final Four and is 31-0 overall. Senior defender and co-captain Vasquez remembers the game against Valley View and the changes that immediately followed. 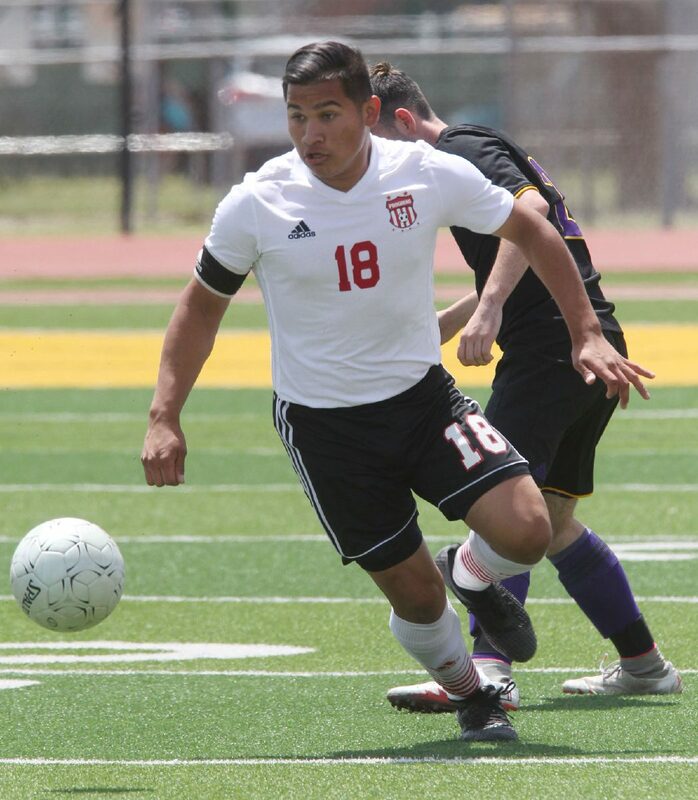 Vasquez was on the field when an errant Progreso throw-in was picked off by a Taylor player and turned into a goal during the first minute of their Class 4A regional semifinal. After the Red Ants secured a comeback win, they knew they had another test in the regional final against Liberty Hill and scoring weapon Jaron Frye. This time, the Red Ants will have two scoring phenoms to contend with. That was in part because the Red Ants double-teamed the Panthers star and kept fresh bodies him. At one point, Jimenez called on Vasquez’s younger brother Michael to be part of the team that was marking Frye. Frye found one opportunity to get away, but the younger Vasquez grabbed onto Frye’s arm and wouldn’t let go. The result was a yellow card for Vasquez. Anthony Vasquez remembers playing Palestine two years ago. A sophomore at the time, he didn’t play much. But he said Progreso was the better team, controlling most of the match. However, the plan to go to penalty kicks worked for Palestine. Jimenez said he isn’t sure what Palestine plans to do this year, but his team will be ready for a wide-open affair or to play against a team that sits back and relies on defense. No matter what style Palestine implements, Jimenez has a game plan set. “Our plan is to attack,” he said. “I know they have more weapons this year than when we met them before, but our plan is to attack and try to keep them scoreless. Let’s put one on them and see if we can handle it.